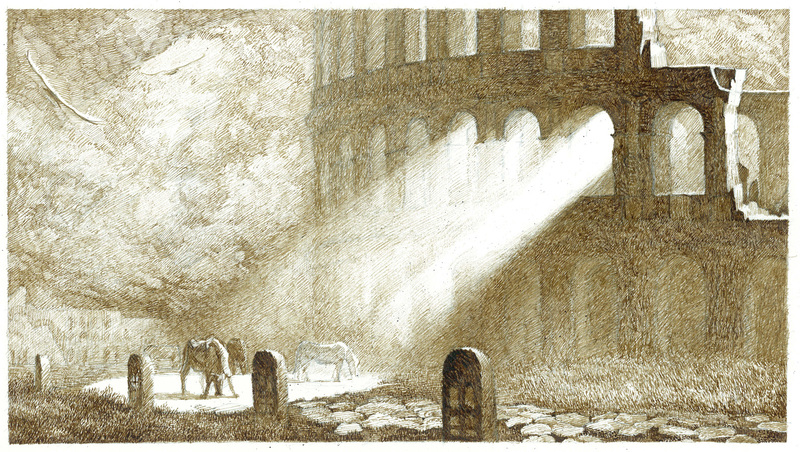 While putting the page together I noticed how most of the buildings seems to echo the proportions of the original arches of the Colosseum, like if the people who took those stones away couldn't refrain from rebuilding something similar. Started in 1455 by Pope Paulus II, was finished in 1467. It was sold in 1564 to the powerful Republic of Venice as a residence for their ambassadors and of the Cardinal of St. Mark (who traditionally was a venetian), hence its name. At the end of the XVIII century it was included among the properties that passed from Venice to the Austrian empire as an effect of the Treaty of Campoformio, but in 1916 the Italian government reclaimed it (Italy then was at war against Austria) and restored it. 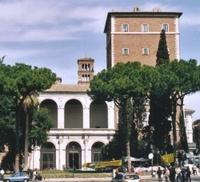 During the fascist regime it became the See of the Prime Minister (the famous Mussolini balcony). It was reopened to the public in 1944 and now there is a Museum of artworks of different kinds: paintings, tapestries, sculptures, ancient weapons, clothes, gold and ivory artifacts. The Basilica of St. Mark was founded in 336, but it has been rebuilt many times. The one we see today was built in 1455-71 by Cardinal Barbo, who later became Pope Paulus III, for the venetians in Rome. The inside has been rearranged in the XVIII century, by adding a baroque decoration, but luckily the front was left untouched. The facade, with its three arches loggia, is attributed to famous architects: Giulio da Maiano, or Leon Battista Alberti. It is considered one of the most stylish piece of architecture of the Renaissance. The bell tower dates back to the XII century. 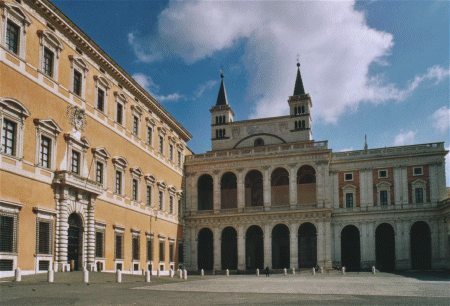 Built by Domenico Fontana for Pope Sixtus V between 1585 and 1590, it stands more or less in front of the Palace of Lateran. It was built in order to contain and preserve the old private chapel of the Popes, called Sancta Sanctorum, that was at the first floor of the old palace, called "Il Patriarchio". The Pope also arranged there the great staircase of the old palace, and it happened that from the XV century the worshippers started to identify it with the staircase that Jesus is said to have ascended, battered and bloody, during his trial at Pilate's palace, hence the name of Scala Santa (Holy Stairs). This false belief is still alive, and is also reinforced by the glass that covers some of the steps, which are supposed to show the marks left by Jesus' blood. If you want to pay a visit when in Rome, remember that you are supposed to ascend the Holy Stairs on your knees. St. John's is the Cathedral church of Rome, and the Seat of its Vicario (which is, traditionally, the Cardinal that deals with the diocesis of Rome, since its real bishop, the Pope, is always very busy in the Vatican). It was founded in the IV century on the estate of a wealthy family called Plauzi Laterani, whose properties had been donated by emperor Constantine to the Pope for this purpose. The church was rebuilt many times, and the one we see today was designed by Borromini for the Jubilee year 1650. 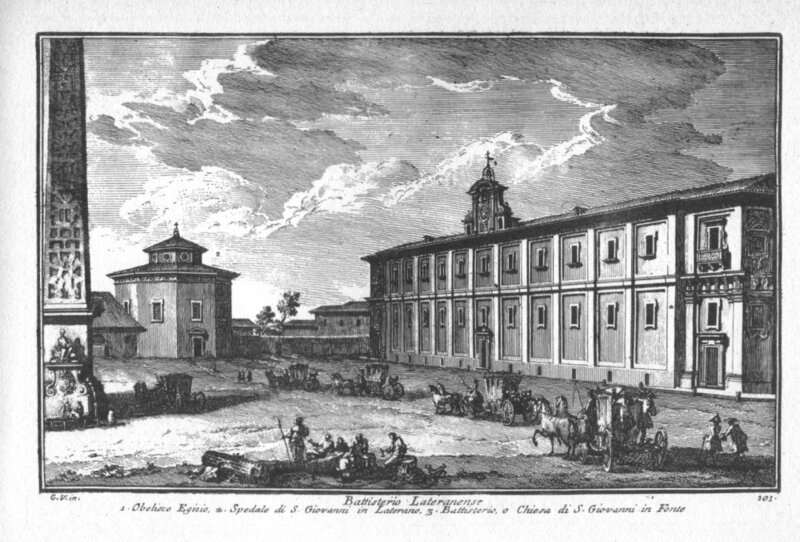 Pope Clemens XII rearranged the facade in 1735, and Leo XIII the apse in 1885. The stones of the Colosseum were used in 1439 to repair the tribune of the basilica. 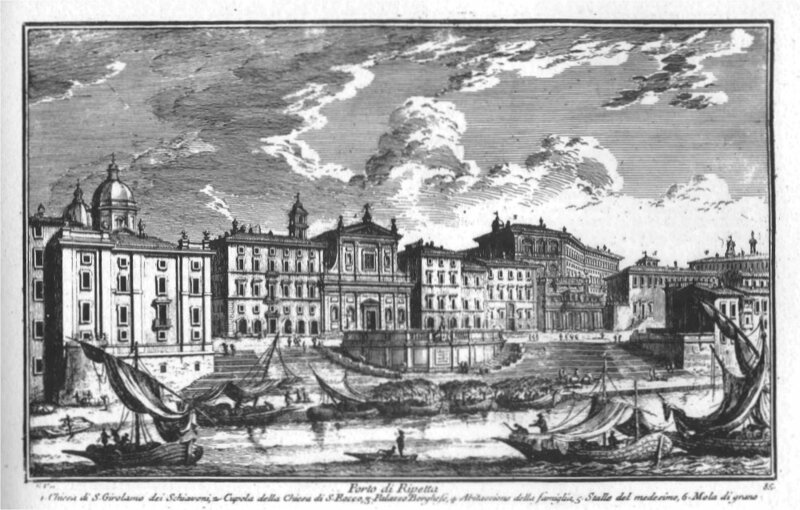 Below, the print on the left, by Giuseppe Vasi, shows the rest of the square, with the obelisk, the baptistery and the hospital on the right. The photo on the right shows the elegant five-arch transept built by Domenico Fontana in 1586. From the upper veranda the Pope blessed the devotees. The plan of the square and surrounding palaces, as everybody should know, is by Michelangelo Buonarroti, who devised its beautiful proportions and harmony of style. 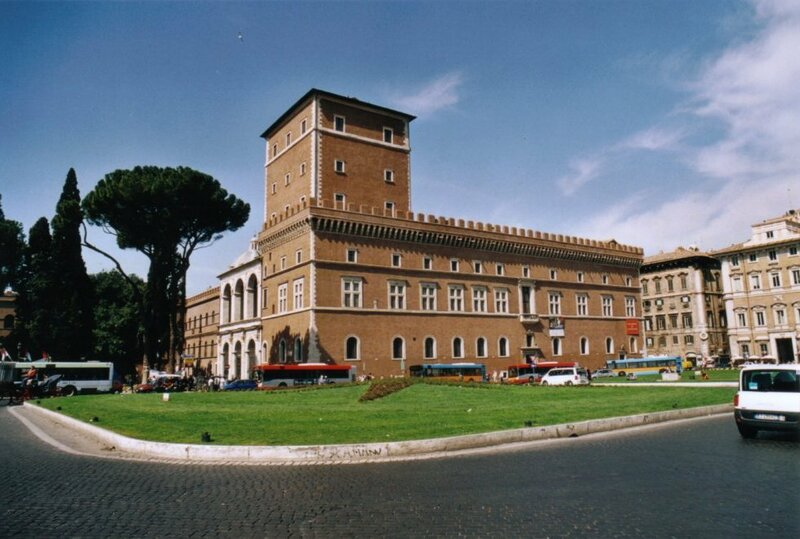 The palace was actually built by Giacomo Della Porta, starting in 1563. The central window was widened up later on, to give more light to the interiors. Maybe not even Michelangelo thought of everything ! Here it's another masterpiece of the Renaissance. Started in 1485 and completed in 1513, is attributed, maybe falsely, to Bramante, who in fact came to Rome after the start of the building. More probably the architect is Antonio da Montecavallo, though it is believed that Bramante designed some elements of the courtyard. 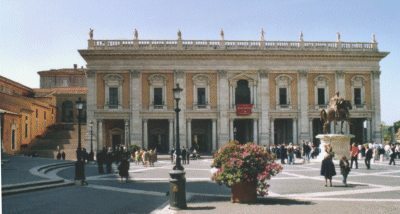 The palace was originally the seat of the magistrates of the Church, and then it hosted the Republican Tribunal (1798-99), the imperial Court of Napoleon and the Roman Parliament in 1849 (the short-lived Roman Republic was proclaimed there). 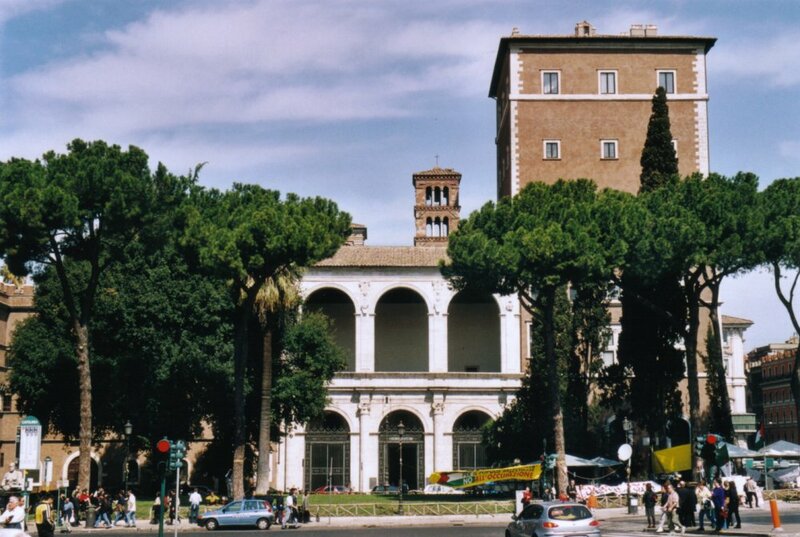 After 1870 and the birth of the State of Italy it remained the Chancery of the Vatican, and it enjoys the privilege of extraterritoriality (which means that the palace is an enclave of the Vatican City in Italian territory, like the Lateran). 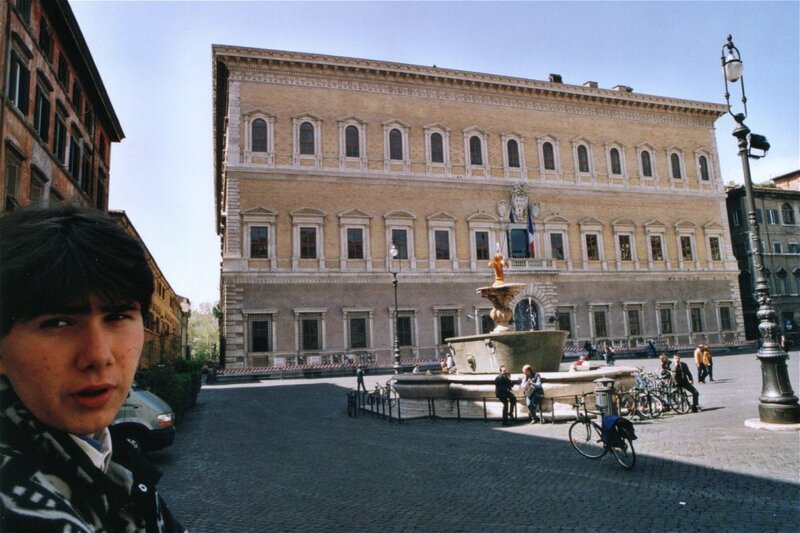 The Italian Touring Club guide defines it "The most beautiful of the XVI century palaces, that triumphantly closes in Rome the architecture of the Renaissance, started with Palazzo Venezia". Can I say more ? Three famous architects worked on it: Antonio da Sangallo the Younger started the works in 1514, Michelangelo took over after Sangallo's death, and then it was completed by Giacomo della Porta. Sangallo made the facade, Michelangelo the cornice and the balcony. 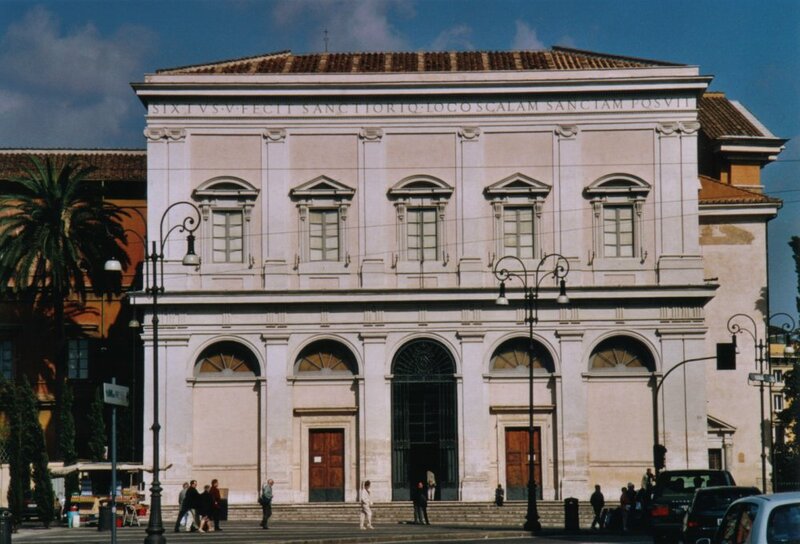 The palace passed from the Farnese family to the Bourbons of Naples, and now it is the seat of the French Embassy. In the photo, a bit deformed because of the wide-angle lens, you can also see Daniele's face. 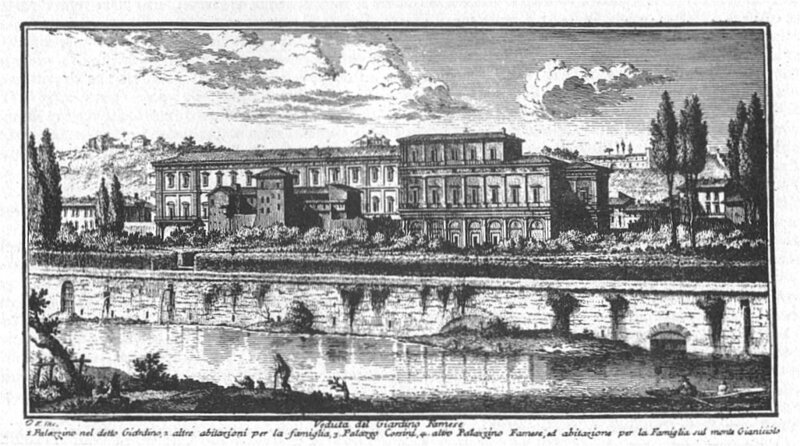 On the left the back of the palace, the famous Giardino Farnese, as it was in the 18th century, before the banks of the river were built. This print is by Giuseppe Vasi. The print on the right shows the Porto of Ripetta, a small port on the river Tiber. It was used for receiving commodities (including fresh water) from the countryside. 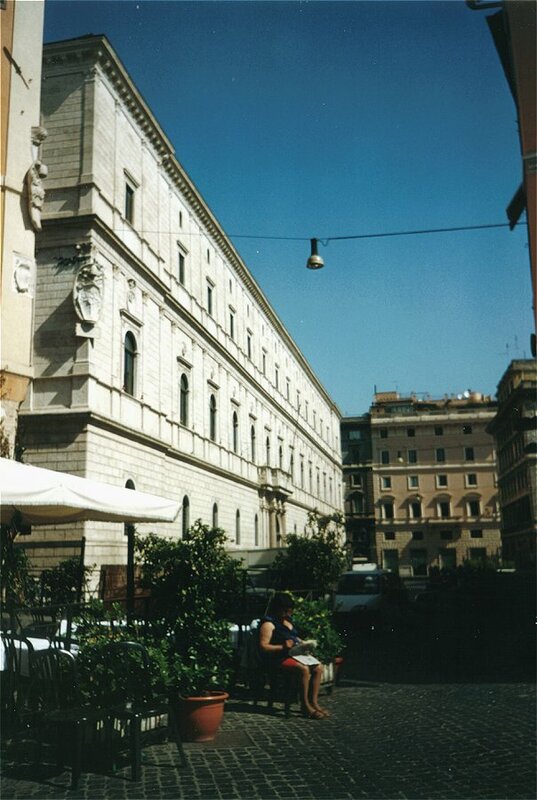 Leo X opened a street (via di Ripetta) to link the harbour with Piazza del Popolo. Timber was unloaded at a mooring point slightly to the north of Porto di Ripetta: it was called Porto della Legna. The area around Ripetta had the typical bad reputation of harbours. After the 1703 earthquake, that caused many travertine blocks to fall from the Colosseum, in 1709 the stones were used by Alessandro Specchi, under the Pope Clemens XI, to build new harbour facilities. The need to protect Rome from flooding led to the decision in late 19th century to build banks on the side of the river, and the harbour, which had no economic rationale in the railway era, was demolished. 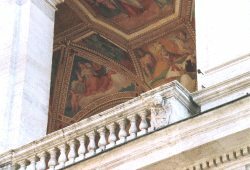 Continue to explore baroque Rome in a fantastic site, following the itineraries suggested by 18th century artist Giuseppe Vasi and comparing them with the modern view.